As everyone doesn’t know, the Second Largest City in the United States, Los Angeles (pop. 3,972,000) has a lack of housing. Even people who own homes admit, privately, that not everyone should be forced to live on bus benches and sleep alongside the Orange Line Busway. 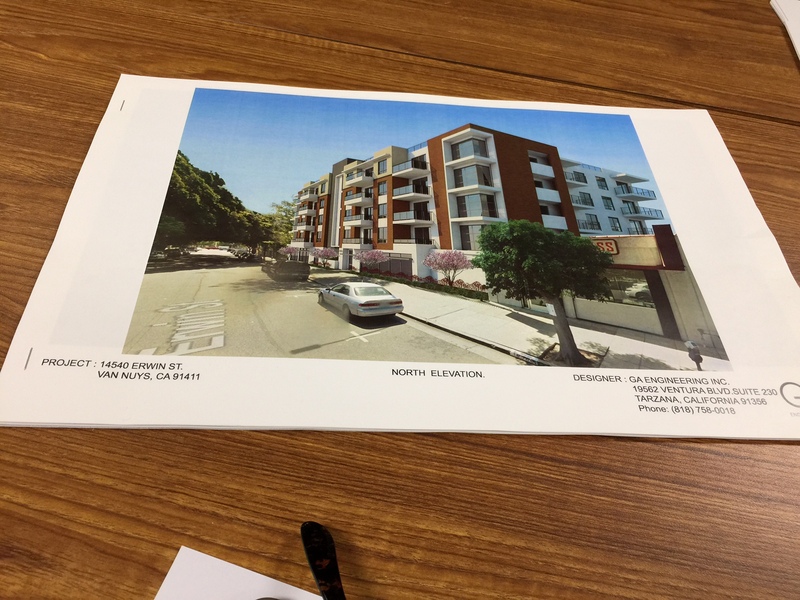 So at last night’s Planning and Land Use Meeting of the Van Nuys Neighborhood Council, several apartment projects were presented, which will, collectively, add some 250 apartments to an area, now occupied by 180,000 people, renting for an average of $2,000 a month. Housing is coming to Van Nuys, again. And the board was saying yes, every time. For the millions starved for housing, some crumbs are being dropped from the sky. Giant apartment builder IMT plans to erect a 6-story-apartment at 6500 N. Sepulveda Bl. north of Victory Bl. 160-units will have 275 parking spaces on site. The building, architecturally, has a pleasing look of rhythmic, stripped down modernism. Renderings, of course, show it with spotlights, at sundown, without whores, discarded mattresses and homeless people pushing carts on the sidewalk. On Thursday, April 27th, at 6pm there will be a community meeting with 6500 Sepulveda developer reps at the Van Nuys Library. So far, 3 people (out of 2,000) in our neighborhood, adjacent to the proposed apartment, have replied that they will attend. 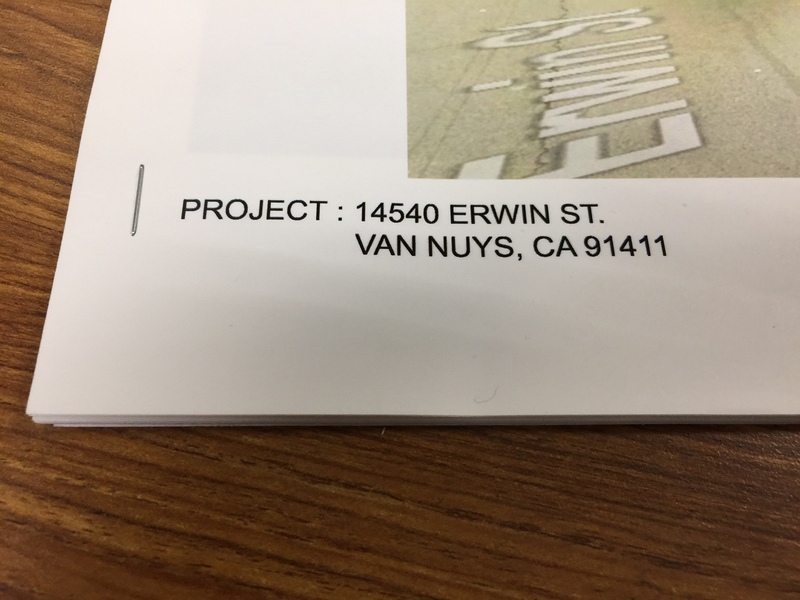 At 14530 Erwin Street, west of Van Nuys Blvd, a 48-unit, 5-story apartment building is planned on the site of some auto repair shops. Again the proposed structure is attractive, with a modern look. My first reaction was to applaud the addition of upgraded housing within walking distance of the Van Nuys government buildings. One could imagine future residents biking, walking, taking the bus, shopping for groceries. The effect of having new housing on a street now occupied by empty parking lots and gruesome auto shops was uplifting. However, one of the board members (whom I like a lot) asked, “why would you build on such a crappy street?” I wanted to bang my head against the table. Self-sabotage is such a running theme within the Van Nuys Neighborhood Council. Yes, why bring good development into a bad area? For that matter, why bring a shelter dog into a loving family? The presenter, politely, replied that land is cheaper in Van Nuys than other areas of Los Angeles. That makes its development more feasible. Sometimes the economics lessons spoken here seem self-evident. Other projects presented last night included AYCE Gogi, a Korean BBQ restaurant at 7128 Van Nuys Bl. They want to add 20 pinball machines to serve with the garlic beef, bulgogi, pork belly and brisket and beer. At 14831 Burbank Bl. just east of Kester, a new “Brother’s Pizza” is proposed where Napoli Pizza Kitchen used to be. This strip building will have Crème Caramel LA, Brother’s Pizza, My Fish Stop and The Oaks Express Laundry, a very fine laundromat. Finally, 7745 Sepulveda, (near Western Bagel) where AVIO Coach Craft asked for permission to add six spray painting booths expressly for Tesla automobiles. The fine automaker, and rigorously environmental company, will oversee the process of applying paint to its vehicles. And AVIO has the exclusive contract under Tesla, a business that will paint 300-400 cars a month. Apartments, pinball machines and auto body painting. Van Nuys is making progress into the future.